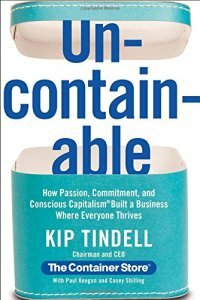 I’ve been reading the book, Uncontainable, by Kip Tindell. It’s the story about how The Container Store came in to being, and also about their philosophies. At this point in time, I am about half way through, but I wanted to share about how inspiring it is. It’s about people actually believing in people and helping to bring out each other’s best. If I was to ever want to work for another company again, I would want it to be for them or someone like them. They have developed an enthusiasm that is palatable. Customers have felt the energy when they have gone into their store, and many of their customers became employees. What has carried over is the company’s passion. They truly want to help people be more organized. So I’m not here to talk about how you should get organized, although that might be helpful. What I’m here to talk about is enthusiasm and passion. I believe this team of people could sell anything, as long as they believed in it, and that is what is key for them. They believe in their mission and therefore feel like they are fulfilling a need. They work hard at hiring like-minded people – people that are also accountable and committed. This company also believes in communication; one of their beliefs is – Communication is Leadership. They keep both supervisors and coworkers informed. I think it is so helpful to have good communication. Another positive characteristic that this company practices is Teamwork. They believe in working together to produce the best outcomes. The proof is in the pudding, so to speak; they have a very low turnover rate. I am so inspired to have found that that these kinds of people do exist. I am ready to read more of Uncontainable. I bet that is an interesting read. I’ve always wanted to order from The Container Store. Feel free to share this review in my Super Sunday Reviews link up on my blog if you would like. Marsha, yes it is an interesting read. Tindell writes with a personal style. The Container Store does have a lot of neat options. Thanks for the offer. : ) If I remember to check it out on Sunday, I’ll be there. It’s such an incredible store, that the back story must be a great read. Onto the wish list with it. Thanks for sharing this. Hadn’t heard of it before. Merry, I did check them out online, and it is incredible, as you say. I wish there was one near by that I could check out in person. The back story is a great read. You’re very welcome.